Students in year 10 and 11 follow the AQA course in Art and Design. Students are required to produce two coursework projects over the 18 months of the course. Themes for projects will be selected that will encourage pupils to work from direct observation as well as make links with the work of other artists, craft-workers and cultures i.e. Still life and Cubism, Insects, Animal print , Social and Political etc. 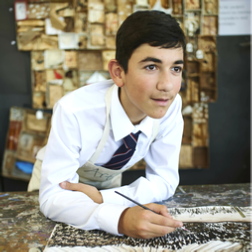 In the spring term of Year 11, starting Mid-January, students start preparatory work for their final GCSE exam piece. Students are expected to select one starting point from a list provided by the examination board as a stimulus for their own work. Students have 10 weeks in which to plan and prepare for their 10-hour exam, which normally takes place after Easter. The majority of the course is very practically orientated with students developing work and ideas from a theme set by their teacher. A project is made up of a number of observational drawings and secondary studies using a variety of media and develops their studies into a particular discipline i.e. painting and drawing, sculpture, 3D construction, printmaking. Students must produce one project as a painting and drawing but this piece can include any choice of media and materials.